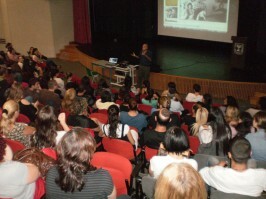 During the 2010-2011 academic year of the project “Raoul Wallenberg in Our School” – organized by the Casa Argentina in Israel and the International Raoul Wallenberg Foundation – the educator Eli Yosef spoke last November at Ramot de Bat Iam school, about the Swedish diplomat, rescuer of 100,000 Jews. 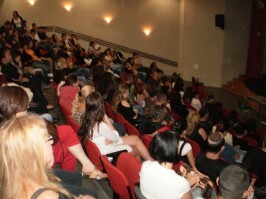 In front of a large audience composed of both parents and students who are preparing their school trip to Auschwitz, Eli Yosef managed to captivate the audience with his moving story about the life and work of Swedish diplomat Raoul Wallenberg, whose mysterious disappearance, at the hands of the Soviet army, was never clarified. His monograph presentation was accompanied by a projection of photographs and documents relating to the subject. Schools interested in receiving – free of charge – Eli Yosef conferences on Raoul Wallenberg, please contact us at tel: 02-625 79 96. The lectures are held in Hebrew, English and French.